The first experiments are implemented using the FT1000D. 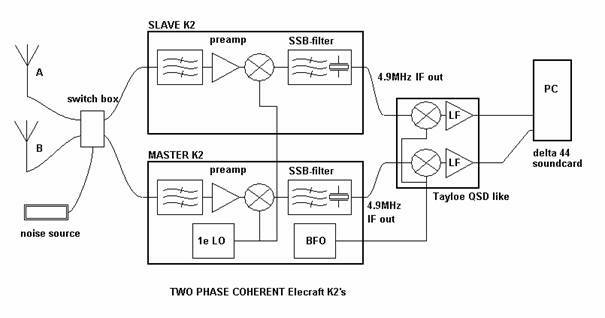 Better results and more DSP are feasible using two phase coherent Elecraft K2 receiver front ends. The software now is designed for the K2 hardware. Figure 9.1 shows the total system using the FT1000D. Both antennas are connected to the FT1000D. The FT1000D has two synchronized receivers, a main receiver and a sub receiver. Unfortunately, both receivers are not identical. In the DSP we have to take into account the fact that the frequency and phase characteristics are different and that the phase difference between both receivers is constant in time, but unknown. A modification has been fitted in order to tune in both receivers via the main tuning button. Figure 9.1 — The total system using a FT1000D. The audio signal from both receivers is acquired via the soundcard. No extreme specifications are demanded of the soundcard as the receivers already carry out the AGC. A disadvantage is that software buffering is required on input and output for the uninterrupted processing of sound. This leads to an extra non-functional delay of 0.2 seconds. Apart from the fact that this is not ideal for tuning, it handicaps QSK telegraphy. For real-time processing, a 3-GHz Pentium PC is required. The noise source is used to equalize both receivers in the DSP regarding frequency characteristics. For this, we connect the noise signal to both receivers at the same time. An adaptive filter (nLMS) then corrects the audio signal from the sub receiver. All DSP needs to be done at the Intermediate Frequency level, inside the AGC-loop. There are several ways to go for. A very realistic one is by using the front-end of two Elecraft K2 receivers. See figure 9.2. Figure 9.2 — The total system using two K2 front ends. The RF-board of the second K2 is build as a slave inside the master K2. The first Local Oscillator is shared. The outputs of the SSB-filters, @4.9MHz, are down converted to audio and connected to a Delta 44 soundcard in the PC. The BFO of the master K2 is used for this down conversion. We now have the antenna signals down converted while maintaining the amplitude and phase relationship. Of course now the DSP has also to do the AGC !! And because of the high dynamic range at the input, a Delta 44 soundcard is used (needed). Unfortunately, here also both receivers are not identical. The noise source is again used to equalize both receivers in the DSP regarding frequency characteristics. For this, we connect the noise signal to both receivers at the same time. An adaptive filter (nLMS) then corrects the audio signal from the slave receiver.